#5 Virginia Tech 10 - #20 Clemson 38. The last time the Hokies took the field, things did not go as planned, as the team was blown out in the ACC title game against Clemson. Much hyped running back David Wilson was completely shut down, rushing for just 32 yards on 11 carries. And with the Hokies down by so much, QB Logan Thomas threw the ball 44 times and was not great: 22/44, 274 yards (6.2 YPA), 1 TD, 2 INTs. Meanwhile, Clemson did just about anything they wanted. As a team, they rushed for 4.8 YPC on 45 carries, which is the best performance of any team against the Hokies this season. QB Tajh Boyd went 20/29 for 240 yards and 3 TDs. The vaunted Hokie defense was wholly shredded: 457 total yards, 8.0 YPA, 4.8 YPC, 0 turnovers forced. Ohio 34 - #15 Michigan 40. Game column. I mean, you know what happened. If the Hokies are known for anything, it's their defense. Virginia Tech boasts the #17 rushing defense, #13 pass efficiency defense, and #8 scoring defense, while coming in at 30th in turnover margin. They run an aggressive, blitzing defense that gets most of its production from its secondary and pair of sophomore defensive ends. As mentioned around here earlier, four of the Hokies top five tacklers are in the secondary. Those four secondary members account for 3.5 sacks, 8 INTs, and 21 tackles for loss. The Hokie secondary plays downhill, blitzes frequently and is often involved in the run game. While that sounds intimidating, the Hokie linebackers are subpar at best. They overpursue to the ball, have trouble filling running lanes, and bite on play action frequently. That the Hokies have such a good run defense is due to the fact that they sell out against it with their secondary. On the defensive line, meanwhile, defensive ends JR Collins and James Gayle have some crazy numbers, combining for 20 tackles for loss and 13 sacks. The defensive tackles are unimpressive. Frankly, I'm not sure how this defense boasts such good numbers across the board. Offensively, Michigan should make hay against the interior of the Hokie defense. Al Borges' playbook has the kind of counters that should eat the Virginia Tech linebackers alive, and the defensive line is either ineffective defensive tackles or pin-your-ears-back defensive ends. When you take chances and blitz a lot, you create turnovers and big negative plays, but Michigan has been good in preparation for defenses this year and has all of the pieces to victimize the Hokie defense. With Denard coming off his best game of the year against Ohio (14/17 for 167 yards, 3 TDs, 26 carries for 170 yards, 2 TDs) and seemingly healthy, Michigan matches up well against this defense. Though Mark Huyge's matchup against the Hokie defensive ends looms large, the rest of the line should be able to contain the blitz-heavy front of Virginia Tech. In the secondary, the Hokies will show both man and zone coverage, and while MGoBlog has been kind of terrified of the Virginia Tech secondary, I'm more confident in Michigan's ability to find holes in the intermediate areas of the field where the linebackers were supposed to be*. On the ground, Fitz Toussaint should have a big game. Given the struggles of the Virginia Tech linebackers and Toussaint's noted ability to cut back and burst upfield, if the offensive line can create any holes (and it seems like they should be able to), Toussaint should gash the Hokie defense frequently. *Something I've been thinking about this year: Rich Rodriguez's QB Oh Noes were usually used to attack opposing safeties and get big plays. Borges' have been used to attack linebackers for 10-15 yard gains. I think this will be a huge factor in the game. Though the Virginia Tech defense boasts some impressive numbers, the offense is not quite as intimidating, at least on paper: 29th in rushing offense, 66th in passing offense, and 52nd in scoring offense. The dangermen are running back David Wilson and QB Logan Thomas, but really, most of the work falls on Wilson's shoulders. The Hokies run the ball about 60% of the time with Wilson averaging 6.1 YPC. Though it may qualify me as a crazy person, I don't think too much of Wilson. He has a tendency to bounce the ball outside even when he shouldn't, and despite having a devastating spin move, seems like a pretty regular running back. There are mitigating factors: the interior of the Hokie offensive line might be the worst that Michigan faces all year. The Hokies are more or less unable to run up the middle despite being fond of using pulling linemen and running power. Mike Martin and Ryan Van Bergen are set up for big games, and if Jake Ryan, Desmond Morgan, and Jordan Kovacs are disciplined and maintain the edge on rushing plays, I expect Wilson to have another poor game, closer to his performance against Clemson in the ACC title game than against some of the team's weaker opponents. Oddly, it's Thomas who scares me more than anything else on Virginia Tech. Thomas is a slightly mobile rocket cannon (think Ben Roethlisberger, except not a despicable human being). With a clean pocket, Thomas can hit receivers in stride and rifle passes into any hole in the defense. Maybe it's just residual fear from 2010 or turning Braxton Miller into a capable thrower, but watching film on Thomas makes me fearful of this game. Getting to Thomas is key. He has a tendency to throw some bad interceptions, but is far too accurate with a clean pocket for Michigan's secondary to adequately cover all game. Oddly, despite the Virginia Tech interior line being horrible in run blocking, they seem to handle pass blocking pretty well as long as the defense is only bringing four linemen. Greg Mattison blitzes and Martin's ability to shuck interior linemen on pass plays are what is going to decide this game for Michigan's defense. They Hokies also have a bit of option running in their game. They have shown both the inverted veer as well as a triple option look in the games I've watched this season. Earlier in the year, Mattison mentioned that the contain defenders are always forcing the QB to hand the ball off on option plays, but I would expect them to break tendency against Virginia Tech. Thomas is a huge, rumbling, 6'6" pillar that gets yards because he's bigger than you are. Risking David Wilson in the open field is a worse option than letting Thomas try and rumble for more than five yards. Aside from Thomas' arm and the potential for Wilson to get hyphy on the edge of Michigan's defense, there's really not much about this matchup that worries me. I think Michigan is supremely suited to attack a Virginia Tech defense that is overly aggressive and weak in the front seven. On the other side of the ball, Martin and Van Bergen should show some inspired play against an interior line that gets thrown around by basically everyone. If Michigan can't get any pressure on Thomas, this game could quickly turn ugly, but Mattison and the defensive line will make sure that doesn't happen. Good Denard vs. Evil Denard given, but Michigan's offense gets it clicking early and often. 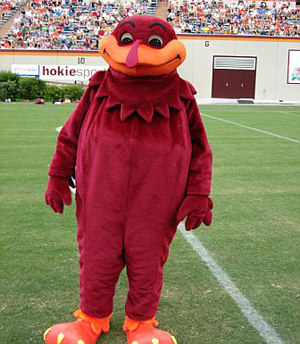 If that's really the Virginia Tech mascot then expect Michigan to win in a blowout. Clearly they have no shame. A note on Tim Hardaway Jr.